Coaches are mentors and leaders, and they can make a tremendous difference in a player's growth both in sports and as a person. 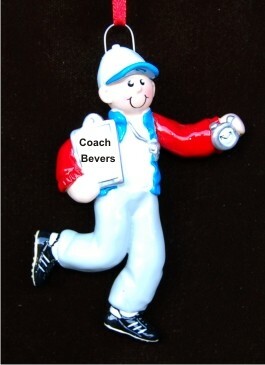 Show appreciation and admiration for such a coach with the male coach personalized Christmas ornament in a sporty design right down to the cool cleats! These sports ornaments personalized by hand include a short sentiment on the front, and there's an option for a longer message on the back. This one arrives in our handsome velvet gift and storage bag ready to display on a tree, gear bag or in an office. Give something back with the men's coach personalized Christmas ornament in a fun, athletic design.